Hola mi gentes! I hope that all is good with you. Ok I know that we have just gotten over Halloween and now Thanksgiving is peeking around the corner. This is the time of year when we all gather with our families and friends to give thanks, celebrate, and eat, eat, eat!!! Many of us are truly blessed to be able to have more than enough to eat yet there are just as many who have nothing. 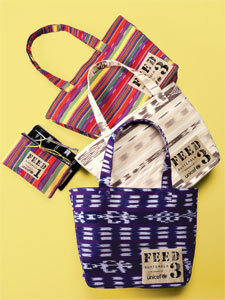 This brings me to the post at hand…FEED Guatemala Bags. They have paired up with UNICEF and Lord & Taylor and are selling the cutest bags with a portion of the proceeds helping to provide nourishment for children in Guatemala. All of the bags are handmade by women artisans and it celebrates the traditional craftmenship of the locals.